Well poop. For whatever reason your previous birth ended up in a surgical birth, otherwise known as a C section. And that may or may not have sucked for you. Some people are wrecked, and some are like “Whateves, I’m good.” For those of you taking it in stride, you gotta start massaging your scar, like ASAP, before you get pregnant. LOOK, I found a video for you, and that would be one I did BEFORE I took Share Ross’s Rockstar Video course. so its less, um, polished, but the general gist of what can happen if you don’t work on your scars is covered. And by work I mean just “Get all up in there,” to quote one my client Angela. And get all up in there gently, like I demo~ed in this (low volume) video using silly putty. For those still reeling and processing, you might need more support. There might be more to it than searching around for a youtube video on scar work. Sometimes healing is a rougher road, a labyrinth, which I think is eloquently described in this post. Healing is intense and winding, but its important work my loves. Let’s really think about this through, its crazy important to do whatever you can to increase the odds for a successful VBAC. Local Houston doctor Christina Davidson was asked what’s the biggest downfall of VBACS, and she said ADHESIONS. That’s right loves, scar tissue and connective tissue thats gotten bananas. That scar tissue can pull your uterus out of allignment, and tuck it to your bladder, or stick it to something (like an organ) so that it isn’t allowed to perform its function. 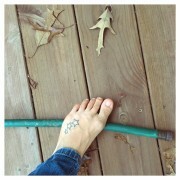 Go outside and step on the hose, and now turn the water on. That would be a uterus with adhesions. Decreased capacity for getting the job done. Try and do your job now you contorted and adhered uterus! Massage can loosen them up, so there is less crimping, more flow. And for sure much adhesions get remediated by the subsequent pregnant belly, but for reals maybe some proactive massage might 1) not give you the ripping adhesion sensation during pregnancy and 2) prevent or clear some of that up before baby is on board. So to clarify, more massage and scar reduction now equals less pain and tenderness in pregnancy, and increases odds for a successful VBAC. So what to do if you aren’t feeling all good about a DIY? I created this incredibly tender hearted step by step scar reduction course. Its hosted on Udemy for now, and soon to be moved over to here. I’d love it if you gave it a try. Remember, IMO the first step to a VBAC is scar massage. Ready to give it a go? Got a question for me? Leave a comment and I’ll tell you want I think. xoxoxo, Rowan ps thank you to my foot model Sam!